The rise in Trinamul's support base across Darjeeling has prompted Gorkha Janmukti Morcha president Bimal Gurung to toss a challenge at the ruling party of the state. 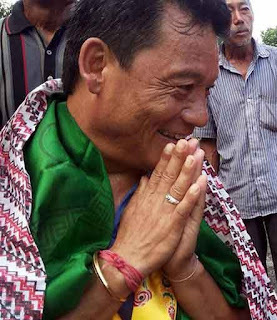 Gurung, in Salbari today off NH55 and on the outskirts of Siliguri, said his party was all set to contest to win in all the seats in the civic and rural elections. He remarked that other than the Morcha, there is no other political force to reckon with, as far as the hills are concerned. "Even if the civic and rural polls are held in the hills tomorrow, we will win in all the seats," the Morcha president said. "There is no presence of any other political party in the hills. Sab khatam ho gaya (every other organisation is over)," he said. Such assertion from the Morcha president, that too during his visit to the plains, comes at a time when Trinamul is augmenting its political base across the hills. While on the one hand, the ruling party has managed to get some of the top Morcha leaders and even popular leaders of other hill parties on board, on the other hand it has used the state to set up development boards for various hill communities. "Such a two-pronged strategy of Trinamul has left the Morcha in an awkward position. In places such as Kurseong and Kalimpong, Trinamul has made inroads by poaching in the Morcha, a repetition of what the Morcha had done to the GNLF in 2007 and onwards when Gurung, who himself is from GNLF, floated the party," an observer said. Added to it, the formation of the boards where representatives of these communities have been put in portfolios and funds have been allocated for socio-economic development and for conservation and promotion of heritage and culture of the communities, has provided an additional thrust to Trinamul to penetrate into the hills. "While the state has formed so many development boards, the Morcha, a BJP ally, has not yet managed to get ST status for some of the communities. It is a longstanding demand of these communities and right now, Morcha leaders are under immense pressure to prove that the party they had supported has acted on their demands," an observer added. In 2011, when the polls were held in the four municipalities, the Morcha had bagged all the civic bodies.